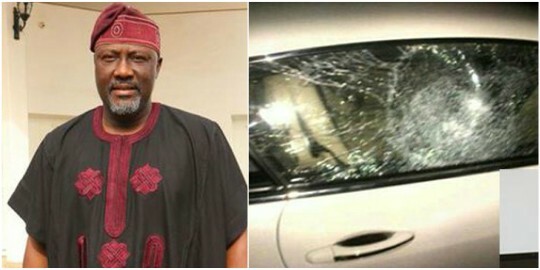 Controversial Nigerian Senator representing Kogi west senatorial district, Dino Melaye, today, escaped assassination attempt on his life as unknown gunmen attacked his residence in Ayetoro-Gbede, Ijumu local government area of the state. “I got a rousy welcome from Kabba to my home town yesterday (Friday) and I know it angered the power that be in the state which mobilised for this assassination attempt on my life. “At about midnight we started hearing gunshot. They fired more than 200 rounds of bullet into the house. This attempt to kill me will not stop me from speaking the truth. “If I speak the truth I will die, if I lie I will die. Me, I’ve decided to speak the truth and die. I’m not afraid of death. I only respect men I don’t fear them. “The DPO did not come to my house until three hours later. Even the area command in Kabba was not notified until I called the CP. I suspect a satanic collabo between Taofiq and the police in Aiyetoro because the duo had a meeting two days ago. “Only God will protect us in this country but definitely not the police”. “I’ve never been a violent man. My running battle with Dino if any is because I have asked him to stop vilifying the state governor, Yahaya Bello.